Ordinary number signatures Kittiya-Chaiyos EF about 47,200 - 49,600 baht. Ordinary number signatures Kittiya-Chaiyos VF about 27,100 - 28,500 baht. Ordinary number signatures Kittiya-Thep UNC about 80,000 - 84,300 baht. Ordinary number signatures Kittiya-Thep EF about 49,600 - 52,000 baht. Ordinary number signatures Kittiya-Thep F about 28,300 - 29,700 baht. Ordinary number signatures Supayok-Thep UNC about 42,500 - 44,600 baht. Ordinary number signatures Supayok-Thep VF about 23,600 - 24,800 baht. The 1 Baht 1st series Thai banknotes were produced by Thomas de la Rue and printed only one side with flat ink as called uniface banknote. The notes were not cirlulated at the time of the first bunch banknote issuance bacause of abundant of coins. But the World War 1 brought the lack of silver and copper and their prices rose over the coin's face value so the coin fusing into the ingot was profitable. The government had to issue 1 Baht banknote into circulation. But the Banknote Act stated that the lowest value of banknote is 5 Baht so the government overprinted 50 Baht on some of uncirculated 1 Baht banknotes and launched them in appropriate amount. The main appearance of notes were like boxing stage plan, the denomination value were on the four corners in Thai and Arabic. The Royal Coat of Arms were in the middle top above Thai words "The Siam government promise to pay the money to the holder in Siamese currency". The image of three-headed elephant watermark located at the middle which surrounded by the watermarks of the Government of Siam and the denomination indicated in both Thai and Roman. 1 Baht banknotes, 1st series, are identical in design to 5 Baht banknotes. The dominant color is gray and the border is printed with black ink. But there are no Chinese and Arabic words like the others denominations. 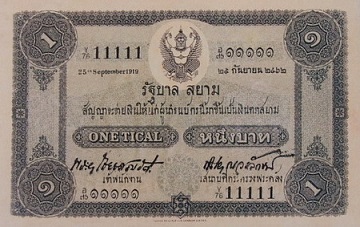 1 Baht type 1 banknotes were not issued in the reign of King Rama 5 but were announced on 3rd October 1918 in the reign of King Rama 6. Z1 - Z100 , Y1 - Y100 , X1 - X100 , W1 - W100 , V1 - V100 and U 1 - U100.